Panteg Hospital was built in 1837 as a workhouse. 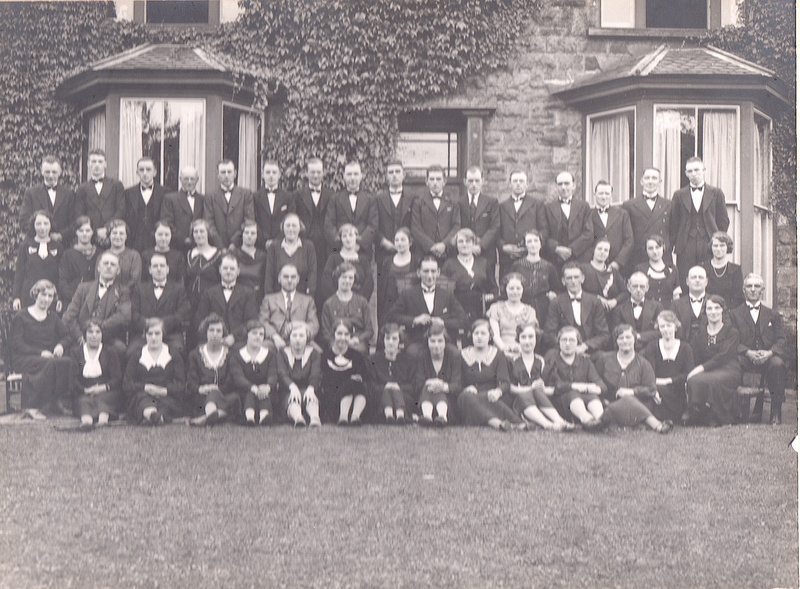 As it was built on Coedygric Road, Griffithstown, it isn’t surprising that it became known as Coedygric Institute. Later it became a mental hospital for women. 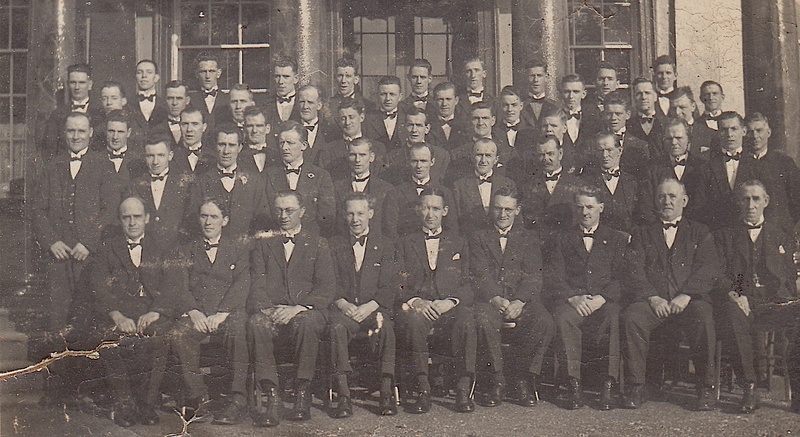 Some of these could be seen from time to time walking the streets of Griffithstown in their drab white uniforms. They were in a crocodile formation with two men leading and two men at the rear. It might be because of this that there was a section of the hospital for mentally ill women in the late fifties when I used to visit the hospital once a month on behalf of the Toc H Film Unit to show the patients a film. This was before television really took over. Once inside we were locked in. I well remember my first visit. I needed to plug the projector into the electricity supply and I knew that there was both DC and AC available in that section. As no member of staff was present I asked some of the patients which plug was used by my predecessor. They confidently pointed out one of the plugs which I then assumed was the AC supply. Unfortunately they were wrong and I plugged in to the DC supply. When I switched the projector on I blew the whole supply for that section of the hospital. It became Panteg Hospital after World War II and had one of the best maternity sections in Wales. Immediately below the hospital is Coed-y-Gric Farm which is one of the oldest buildings in Wales. If any visitors have information about the hospital building, particularly any photographs, or memories of working there, please contact me. In my posting about the Welsh international rugby player Cecil Pritchard, I mentioned that I had obtained my information about him from a page in one of the club’s programmes and that it was written by someone with the pseudonym of “Retlas”. I asked whether anyone knew who he was and my friend, Eric Smith, has come up with the answer. It’s the reversed surname of Jack Salter who for many years was Editor of the Free Press. Jack Salter was very active in the Pontypool area in a number of diverse ways. He was the first Secretary of the Pontypool District Motor and Motorcycle Club and also a member of the Trevethin cricket Club. 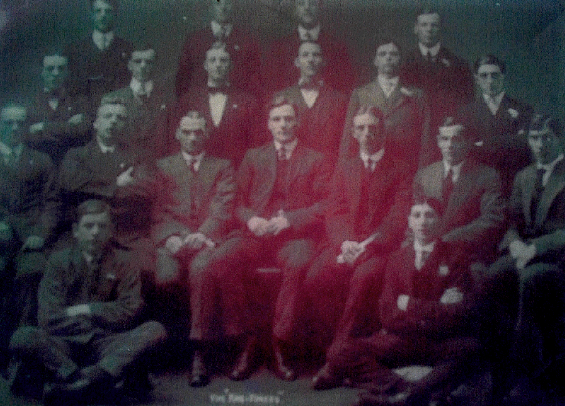 My uncle, Granville Hughes, was also a member as were two West Mon masters: Messrs Whitty and Mosely. Pontyrabad, according to the official holiday guide, was “a small peaceful Welsh coastal town, one of its main attractions being a 12th century Benedictine Abbey, the ruins of which grace a peaceful green common a short distance from the sea”. At the moment. however, the common was anything but peaceful. “Howzat?” bellowed four voices in unison. Titch turned quickly, bat in the air, to look with dismay at his middle stump now lying flat on the ground behind him. He turned and grinned good-naturedly at Gogs, the cause of his downfall. The other four boys converged on Titch who was still standing at the wicket. “I vote we have tea now,” said Bunny, and to reinforce his idea he started to pull out the two remaining stumps. But no one disagreed with him. All five were hungry after their afternoon’s cricket and it was now well past their normal teatime. 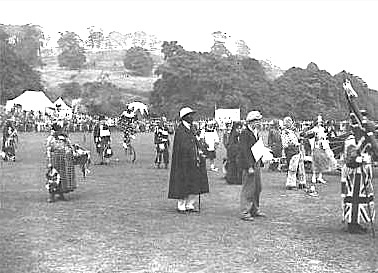 It was often their custom to have what they termed a ‘cricket picnic’ on Pontyrabad common. Having collected their gear together they sat down on the springy green turf to eat their meal. They were halfway through an assortment of sandwiches, fruit, cakes and other tasty items when their banquet was suddenly interrupted by a man’s voice right behind them. “I hope you young gentlemen don’t make yourselves sick.” Turning around they saw a middle-aged man with a large moustache making his way across the common. As the boys turned he gave them a smile and waved his walking stick. “Evening sir!” chorused the boys suddenly realising who the speaker was. “Whacko and bang on!” joked Titch twirling an imaginary moustache now that the teacher was at a safe distance and out of earshot. “I wonder where he’s going,” mused Smudgie. “Home of course,” replied Titch. “Does he live around here then?” asked Gogs looking over his shoulder at the now distant figure. “Yes, I wondered about that too,” added Smudgie. “Well, anyway, that’s why he’s come,” ended Titch. “London,” replied Gogs simply. The others were amazed at hearing such a confident reply coming from him. “And how on earth do you know that?” asked Miff. “Cissy!” jeered Smudgie, at which Gogs flung his empty banana skin at him catching him full in the face. Smudgie launched his reprisal attack at once and fell upon Gogs trying to stuff a hastily gathered handful of grass down the back of his shirt, and in a few seconds the two boys were rolling over and over on the grass until they were interrupted by a shout from Titch. “Come on you two nitwits, it’s time we were going.” Then he grabbed his bat and ran a few yards off. Gogs, who was always ready to fall in wih a challenging suggestion, rose to his feet. He grabbed the ball and, after brushing his hair from his left eye, flung the ball down hard at Titch. A smart piece of footwork enabled him to take the ball on the half-volley and it soared high into the air. Up and away it went followed by the admiring gaze of the other four, and eventually fell amongst the ruins of the old abbey where it bounced amongst the stones. Though the grass on the common was fairly short, being regularly cut by council workmen, their search for the ball was considerably hampered by the stonework which was scattered about where the grass was much longer. 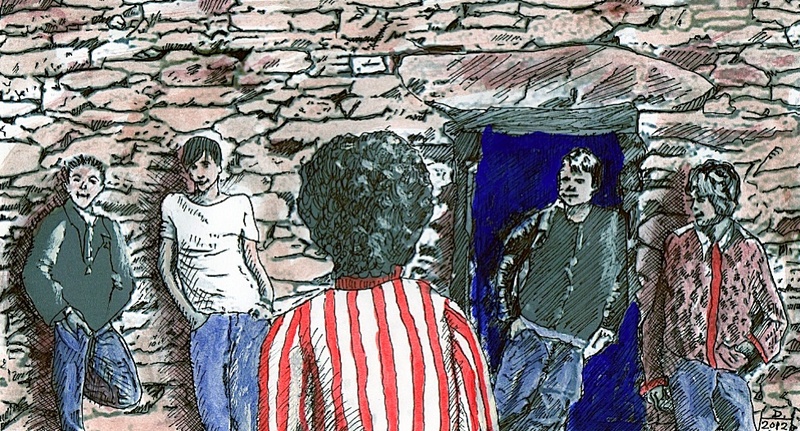 The five boys made their way in amongst the old ruined cloisters, but, although they looked everywhere for it, the elusive ball could not be found. Four young boys were leaning in silence against the stone wall of the old tower on the steep hill rising up from the sea in the small South Wales coastal town of Pontyrabad. They were enjoying their half-term holiday. Their eyes were fixed on the distant figure of a strangely dressed man making his way towards them carrying an artist’s easel and a large portfolio bag. “Wonder why he spends so much time painting the old tower?” mused Bunny Francis. “Sometimes he paints the scenery you can see from the hill. I’ve even seen him inside the tower sketching the scene through the doorway,” added Smudgie Wright. The others appreciated the sense in this suggestion so all four slowly walked around to the side of the tower and mounted the solitary step to go inside. They sat down on some of the very large stones strewn about which had previously been part of the tower wall. “Hi Louis!” they chorused in return. “We’re waiting for Titch,” chimed in Smudgie. “Don’t know where he’s got to or how long he’ll be”. Louis waved his one free hand. “No trouble. No trouble. I’ll go down to the shell house and work down there. I come back here later. Bye lads!” With another wave of his hand he walked around the tower and down the side of the curving hill in the direction of the old shell house. Gogs looked through the open doorway at the retreating figure. “Didn’t seem to want to do any painting here with us around,” he said. “Perhaps artists like a bit of quiet when they’re working,” suggested Miff. “Are you suggesting that we’re a noisy lot?” protested Bunny in mock indignation. “Well, we have been known to make a slight amount of noise from time to time,” returned Miff with a smile. The other three joined Gogs outside the doorway. “P’raps he was late having dinner. You can ask him in a minute or two,” replied Bunny. As Titch joined the others they all chatted for a few minutes and then went inside the tower. 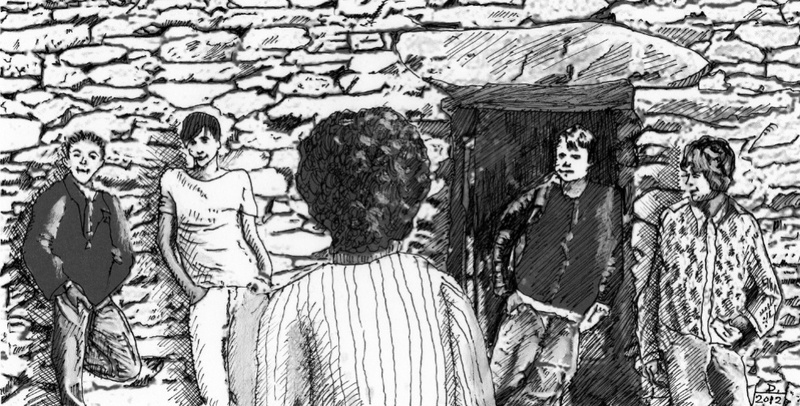 Bunny and Miff sat down on two of the large stones, and Gogs, Titch and Smudgie hauled themselves onto a large rectangle of rough masonry just over a metre high that was built into one of the walls. “Tell us about your idea Titch,” said the ever-eager Gogs. “Yes, August holidays especially need a bit of organising,” added Gogs who was already warming to the idea. “Well, what are we going to do in this society?” pursued Miff. At this Titch stood up and announced with an air of finality, “I suggest we have a game of cricket now.” He went to the tower doorway and looked down the hill. “There’s nobody playing on the common so we can play there,” he said. By now they were all on their feet. 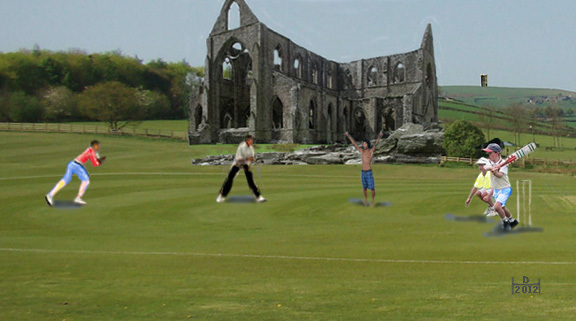 “We’ll all collect our cricket gear and picnics and meet by the Abbey,” announced Titch. “First one there bats first.” This challenge resulted in a mad dash downhill towards the town. In a recent telephone conversation I had with my friend, Eric Smith, he was telling me that a lot of people do not know where The Queen’s Ballroom was in Pontypool. This is quite understandable because it is now known, and has been for very many years, as The Palais de Dance. I remember it by that name way back in the early 1940s when dances and other forms of entertainment were held there. 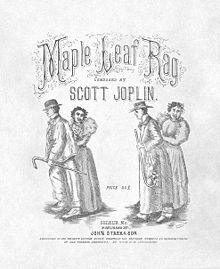 At that time it was the only dance hall in Wales with a sprung floor; in fact there was only one other such place in the whole country with such a floor and that was in the Blackpool Tower. You might remember that, a year or so ago, some of the Strictly Come Dancing programmes were held there. One of the regular events at the Palais de Dance was the annual NSPCC Children’s Ball, an event to raise money for the charity. Eric attended these and, on one occasion, all the children were taken along to Turner’s Fish and chip shop in George Street and were provided with a meal of fish and chips. When Eric asked me to go along to the ball with him I agreed. We were about 12 years old at the time so it was during the war. Sadly there were no fish and chips on that occasion but I do remember going upstairs to have refreshments on the small balcony. I remember it being very crowded with several hundred children in attendance and quite a number of adults. 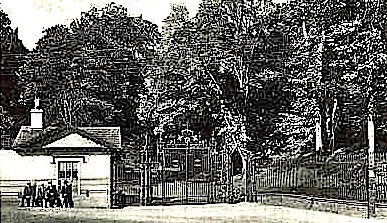 The entrance to the Palais de Dance, usually referred to by Pontypool folk simply as “The Palais” (usually pronounced “pally”), was directly opposite the top entrance to the market in Crane Street. I don’t have a photograph of the whole building but I do remember it had a fairly large foyer leading to the inside doors. There were a few steps down to the pavement. 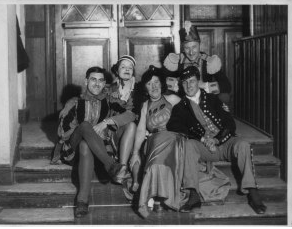 I do, however, have a photograph of a troupe of performers in their costumes sitting on those steps. If anyone has a better photograph of The Palais, please let me have a copy and I’ll include it in a future blog post. Here are some more of the photographs sent in by Terry Stunden. These are all about the carnival which was held in the park. 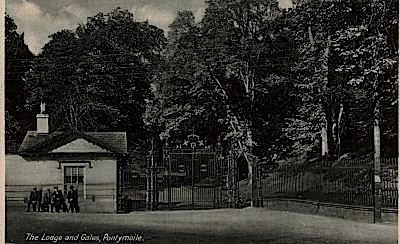 I’ve also included a photograph of the park gates at Pontymoile. If you have a good look at these gates you will see that there are several bunches of grapes on it. One of them is missing! When I was at West Mon I remember one of my teachers talking about this and he told us that the Italian artist who had made the gates didn’t notice his omission until it was too late to rectify his mistake and, as a result, he committed suicide. I don’t know how true this story is. It sounds rather drastic to me. For those visitors who like to look at these old photographs, I plan to post more on the next two Tuesdays at 11.00 a.m. So, if you are collecting these photographs you now know the day and time to look for them. 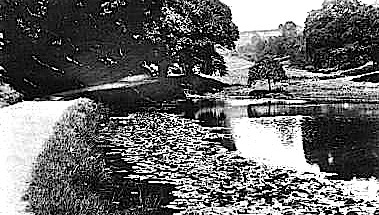 The park lake was another favourite playing place for my friends and I. Apart from the lake itself, there was a stream above which fed into the lake and below the lake another stream, all of which afforded a lot of fun making dams and jumping from one side to the other. 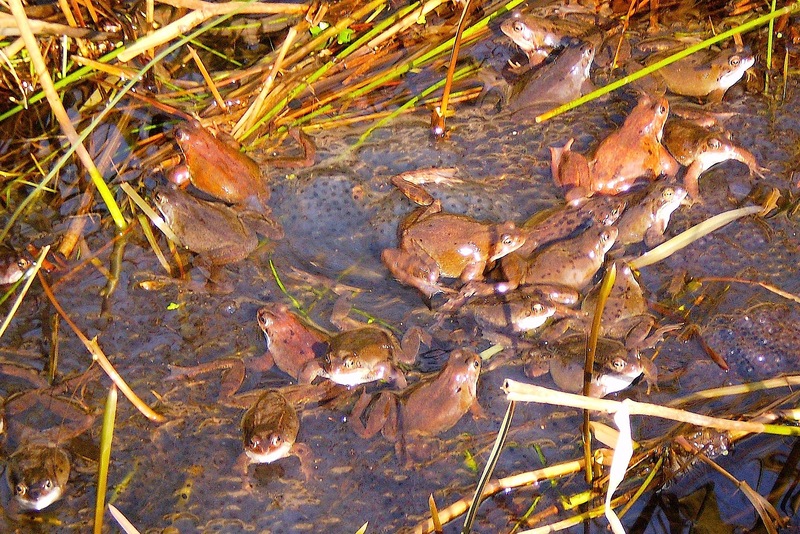 There was also a variety of creatures which lived in the streams and the lake. In one of my very early posts I mentioned that I wrote my first poem about this lake. 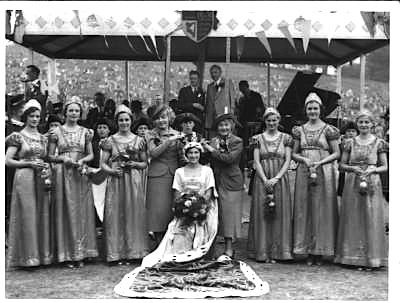 Below are four photographs of the carnival. 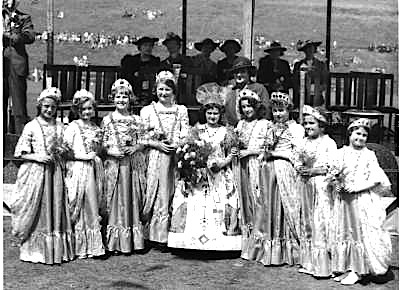 Two are of the carnival queen and her court ladies. The quality of these old black and white photographs was not very good in those days. I’ve tried to enhance them slightly on my computer so there might be some ladies in the photographs that someone might recognise. If so, please let me know who they are. It looks to me as though these photographs were taken just in front of the grandstand, assuming that it was there at that time. Behind the groups you can make out the bank where we used to sit to see all the carnival activities. In the lower shot you can see the path along the bank. If any eagle-eyed visitor can help to date these photographs that would be great. 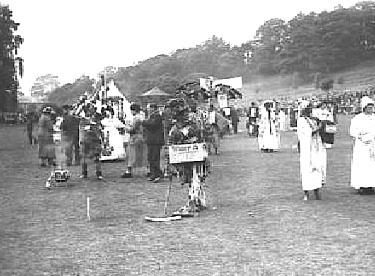 I’m not sure what is going on in the above two photographs but it looks to me like part of the general procession which used to wend its way through town and end up in the park where the judging took place. I hope you enjoyed the photographs. See you next Tuesday. In that post you will see two pictures of the books I bought. One of them is called “Detection and Disguise”. 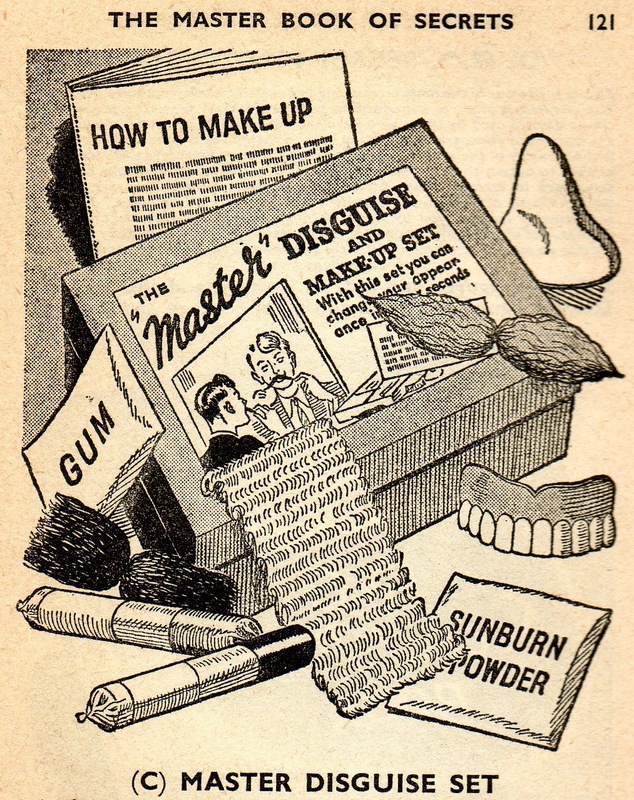 It contained all manner of advice about how to disguise yourself as somebody else so that even your close friends won’t recognise you. This was the sort of thing that Sherlock Holmes often did in the stories we were so fond of reading. He was so good at this that even Dr Watson didn’t recognise him. Eric and I spent hours reading through the disguise techniques recommended in the book. One of the recommendations in the book was about making yourself look a lot older, so, as we were only about 14 or 15 at the time, this sounded like a good idea. It recommended one of the ways to do this was to pad your shoulders out with newspaper, and also do the same with your chest and stomach. This was intended to make us look slightly taller and a bit more corpulent. Under some pretext or other we both managed to borrow overcoats and trilby hats from our fathers as these would offer comprehensive covering over our assorted newspapers which might stick out from beneath our own jackets. Having assembled all our kit we decided to try it out for the first time under cover of darkness. In Eric’s front room we busied ourselves padding our anatomies with newspapers by tying on large bundles with string so that they would stay in place. When we’d finished this we were fairly satisfied that we looked a lot more bulky and when we put on the overcoats and trilby hats we were quite thrilled. By sticking on the false moustaches we were absolutely satisfied that our transformation was complete. By then it was reasonably dark so we crept out of the house and down Wern Terrace eventually making our way down the Bell Pitch and into town. As the shops were shut there were not many people about and those we passed didn’t even give us a second glance. The trouble was that we didn’t see a single person that we knew and that would have been the acid test of our enterprise. Having reached Woolworth’s we decided to stick to our plan and walk further, so we went up Osborne Road. As we approached the vicinity of Merchants Hill we heard running footsteps behind us, then a child’s voice shouting “Daddy! Daddy!” Immediately a little boy of about six ran up to Eric’s side and looked up at him. It was only then that he realised that Eric wasn’t his daddy so ran off again. It was just as well he did because we both almost collapsed with laughter at the event. There was a certain amount of satisfaction as far as we were concerned. At least we must have looked like grown up men. Now, I don’t know whether it was the result of shaking with laughter or all the movement involved in walking a couple of miles but, as we turned up Merchants Hill some of our newspaper stuffing and bits of string worked loose and fell down onto the ground. This, of course, caused more laughter with the inevitable result that more newspaper stuffing started to work loose and fall down. Eventually we ended up with large bunches of newspapers under our arms making us look like latter-day Argus sellers. Our moustaches had stuck manfully to the job. The only trouble was removing them before we returned home. Just trying to pull them off proved rather painful but by applying liberal quantities of spit we finally managed it. We found a suitable place to ditch our newspapers and then returned home. We were reasonable satisfied with our exercise in disguise but we were realistic enough to allow that Sherlock Holmes definitely had the edge on us.